Asking for What you Want (& Tour Dates!) — Is Your Boyfriend in the Band? My goal of podcasting the first Tuesday of the month has not exactly been upheld on my end. That said, I have been managing to push one out per month, and that feels like a little victory that makes me wiggle in my seat. Nothing compares to getting something done, even if it's totally imperfect and you can hear my dogs barking in the background. It's important not to throw in the towel just because you didn't reach your goal. We all slip up from time to time. It's important to keep going, to keep creating. Don't you agree? I can't remember where I heard this mantra, but it keeps me sane (especially as I continue to write my book, which is now at about half the word count I wanted to be at back in November for NaNoWriMo). The mantra is this: EVERYTHING IS PROGRESS. I also started running this month with the Couch to 5K app. It slowly guides you into a groove where (at the end) you'll be running a full 5K without stopping. This sounded totally scary to me. It still freaks me out. I was always the girl who said she had cramps or ditched P.E. altogether! So far, I've managed to keep up with the app, but that doesn't mean that I don't check the timer to see how far I have to go. It doesn't mean I am always 100 percent satisfied with the effort I put in. It doesn't mean it's not grueling. The most important thing, to me, is that I PUT MY SNEAKERS ON. This episode (11 - Ask for What You Want) is about putting your sneakers on. What does that mean to you? You can hear it on iTunes and everywhere else you an find podcasts - or stream from the link below. This one offers up a few tips for thriving in the DIY art world, whether you’re a rock star or not! This one's a little self-helpy, but in a good way. OK, it's a lot self-helpy, but that's where my head's at these days. Yes, I want to share my art and music, but I also want to share the little nuggets of truth that have been my saving grace and pushed me to the next phase. 1) Ask for what you want first. 2) If you don’t get it, don’t freak out. 3) Give yourself what you want, because you totally can (Little known secret!). 4) Keep doing what you do. Revel in the pure joy of creation! 5) Reach out to artists you admire with authentic curiosity. Connect with them in real life. Give. Give. Give. 6) Watch your life (and your art) thrive. Note: I had been thinking about these two concepts: Asking for What you Want and Connecting with Authentic Curiosity, for a while now. I would write them down in my journal, think about it while running (OK, jogging)...basically, these two ideas have helped me so much over the past two years and it has just really crystalized in my mind. Does this ever happen to you? Like, I know something, but that's different than KNOWING it in my bones. It's so simple yet so hard: asking for what you REALLY want. As women, especially, we are often encouraged to be small, silent and even (in some cultures) subservient. Dealing with that as a woman is compounded when you're a female-identifying or simply any kind of outsider/minority artist. I want this episode to be that little nudge of encouragement for your day, whatever that's filled with. So, go ahead. Ask for what you want. Give yourself that validation and permission. Then go forth and connect with everyone! Just make sure you're connecting in a real way. Connection is wasted if it's not authentic. Connect with me by shooting me an email or find me on instagram @hayleyandthecrushers @hayleycrusher. For better or worse, that's where I've been hanging out lately. You can also connect IN REAL LIFE on the road. My upcoming tour dates are below! 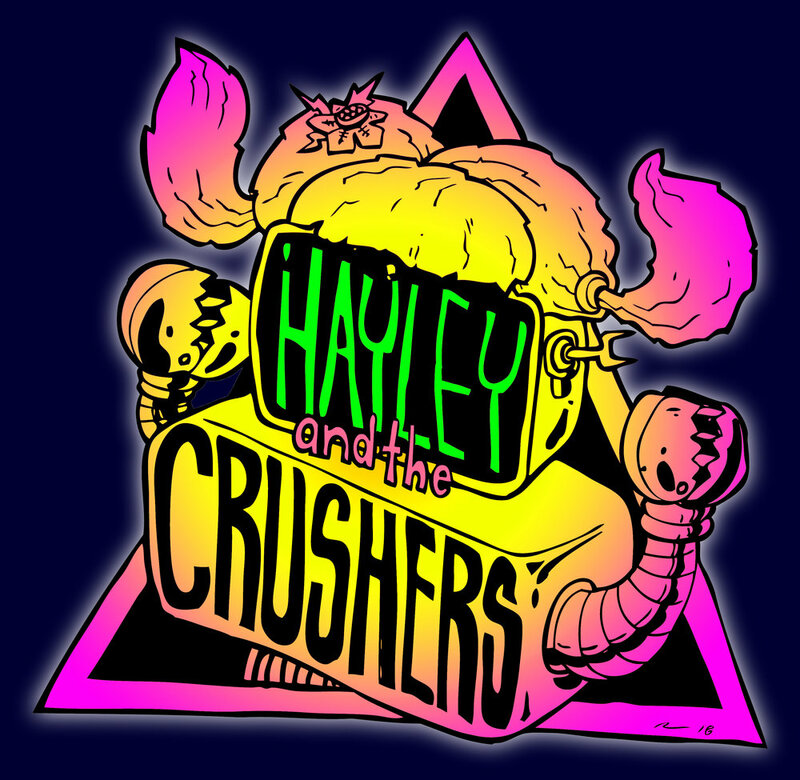 CATCH HAYLEY AND THE CRUSHERS ON TOUR! !